The Industrial Turbine is a multiblock generator used to produce energy if supplied with big quantity of Steam. It's currently the most powerful generator in Mekanism. The biggest Industrial Turbine can produce up to 267,000,000 J/t (107,000,000 RF/t). Fusion Reactor alone producing Steam by itself, with a Water supply. The Steam production rate depends on the fuel input rate of the Fusion Reactor, making it extremely hard to reach height production. Fusion Reactor paired with a Thermoelectric Boiler, the best way to produce huge quantity of Steam. Example : to reach 3,000,000 mB/t of Steam, a Fusion Reactor will need 40 mB/t of Tritium and Deuterium each, while 1 mB/t of each will be enought to power a Boiler with a maximal production rate of 3,000,000 mB/t at full speed. Moreover, an enormous quantity of Water is needed as well to fill the Fusion Reactor or the Boiler. The easiest way to get enough water is to recover the steam from the Industrial Turbine as Water. Each Turbine Vent will push water to an adjacent tank or pipe. Fluid transport rate is a major difficulty. One of the 2 fluids (Water or Steam) can be directly send to the other machine by placing the valve expulsing the fluid directly against the valve receiving it. The other one will need to be transport with pipes that have limited capacities. This problem can be avoid by using Mekanism pipes properties : their transport rate is cumulative. Example : to transport 3,000,000 mB/t of Water, at least 47 Ultimate Mechanical Pipes (64,000 mB/t each) must be connected together, even if the pipes are making loops. Using these formulas, it's possible to determine the most efficient rotor's length regarding the width of the turbine. 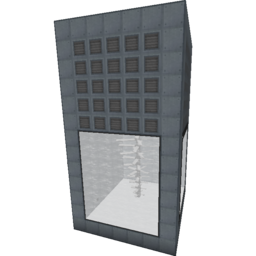 Structural Glass can replace Turbine Casings that are not on the edges of the Industrial Turbine or against another multiblock from Mekanism. It is also possible to replace some Turbine Casings with Turbine Valves. Industrial Turbine must have a square base between 5 and 17 blocks width. Its height can't exceed 18 blocks and 2 x TurbineWidth - 1. Each edge of the cuboid must only consist of Turbine Casings. Each face must be filled with Turbine Casings, Turbine Valves or Structural Glass. The Turbine Rotors must be located in a column above the middle of the lower face. The Turbine Blades will be automatically placed by right-clicking one of the rotors. The Rotational Complex must be placed on top of the Rotor column. The whole layer of the Rotational Complex must be filled with Pressure Dispersers, except the blocks on the sides. Turbine Casings can be replaced with a Turbine Vents at and above the layer of the Rotational Complex, except the blocks on the edges. Electromagnetic Coils must be placed directly above the Rotational Complex, and must be connected together. The rest of the free space inside the Turbine, above the Rotational Complex layer, can be filled with Saturating Condensers, but free space is allowed (if Water output is above the max Steam Rate, it's useless to add more Saturating Condensers). Once a correct setup is created, red particles are emitted to signal the formation of the Turbine. Here is the structure of the most efficient Industrial Turbine with a width of 5 blocks. This page was last modified on 20 February 2019, at 22:14.